From owning a business to governing a state, Tom Wolf has seen it all, but his beliefs stay rooted in helping others and benefitting Pennsylvania. The midterm election took place on Tuesday, November 6, 2018. Scott Wagner, the Republican nomination for the Governor of Pennsylvania, and Tom Wolf, the Democratic nomination, faced off in the race for a place as Governor. Wolf emerged victorious. So, really, what does Wolf’s re-election mean for the residents of Pennsylvania? Regardless of if you had a say in the election or not or voted for him, Wolf’s re-election has the potential to affect everyone in Pennsylvania. A look back at Wolf’s first term can offer some hints at his future plans. Wolf’s track record includes many different plans of action in order to better society, specifically in PA. For example, Wolf refuses a pension and consistently donates his salary to charity. This is one of his attempts to have a “transparent government that works for Pennsylvania,” according to the governor’s website. He also passed an Executive Order in 2015 titled “Employee Gift Ban” where anyone in the Executive Branch are not allowed to accept gifts in general from a long list of people; including those seeking to obtain business from or has financial relations with the Commonwealth, conducts operations or activities that are regulated by the Commonwealth. Wolf also signed an executive order in August of 2018 creating the Pennsylvania Commission on LGBTQ Affairs. This is the only of its kind in the nation. “The creation of the commission on LGBTQ Affairs is one step of many we have taken to ensure obstacles are removed for anyone who is facing an unfair disadvantage based on sexual orientation, gender identity and expression,” Wolf said. Wolf also created a Commission on Latino Affairs, Commission for Women, Commission on Asian Pacific Affairs, and the Commission on African American Affairs. In the 2015 State of the State Address, Wolf said he hopes to lower the corporate tax rate by 50 percent and close the loopholes associated. The current corporate tax rate is nine percent. Wolf is pro-choice, and votes accordingly. He vetoed a ban on abortion after 20 weeks. Wolf is pushing to move the current minimum wage, $7.25, to a “living wage” of $12 by this July, as reported by Pennlive on January 30th. He plans to then increase the $12 by 50 cents an hour every year until it reaches $15 in 2025. Concerning the Second Amendment, Wolf has expanded background checks to cover private sales of long guns, including shotguns and rifles; banned bump stocks, which are devices that allow semi-automatic weapons to fire more rapidly; and increased gun restrictions for defendants in domestic violence abuse and protection-from-abuse cases. In 2015, he vetoed the liquor privatization bill, which would have gotten Pennsylvania out of the wholesale and retail liquor business. Wolf has also created a “Fresh Start” plan, spending $4.6 billion on education and new spending alone. With his new plan, some state income tax rates will rise drastically, with some predictions saying they will rise as high as 121%. Governor Wolf also faced his largest battle, that with his own health. Starting in February 2016, Wolf fought prostate cancer. By the beginning of 2017, Wolf was granted a “clean bill of health.” He advocated for regular checkups and screening for early detection. Wolf’s politics are influenced by his background. Tom Wolf, whose full name is Dr. Thomas Westerman Wolf, was born in Mount Wolf, Pennsylvania. He is the 47th Governor of PA, with his initial induction into office on January 20th, 2015. He went on to receive his A.B. in Government from Dartmouth College, a degree in philosophy from the University of London, and his Ph.D. in Political Science from the Massachusetts Institute of Technology, according to Wolf for PA. While studying, Wolf joined the Peace Corps where he worked on irrigation and agricultural projects in a small rural village in India. While at The University of London, Wolf met his wife Frances. He was a graduate student while she was enrolled in her undergraduate study there.They got married in 1975 in Geneva, Switzerland, where her parents, now deceased, were living while she was at college in London. They have since had two daughters, Sarah and Katie. Sarah, 33, is currently working as an architect in New York, while Katie, 31, is a geologist in San Francisco. Their parents hope they return to Pennsylvania some day. Frances is now an artist. Her work has been featured at the Lancaster Museum of Art, York College of Pennsylvania, and the Artists’ House Gallery in Philadelphia. Before becoming governor, Wolf was the owner of the Wolf Organization, a distributor of lumber and other building products. It was his family business that he purchased and then almost quintupled in size. He was generous with the company’s profits, even sharing them with workers, as said on the governor’s website. 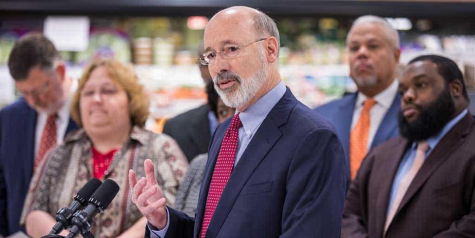 Within the first six weeks of his first term, Wolf proposed a multibillion-dollar tax increase to combat persistent post-recession deficits, corporate tax loopholes and disparities in public school funding. This lead to a nine month stalemate between Republicans and Democrats in opposition in the Capitol. Little of what he originally sought to be law became law. After this, he changed to emphasize bipartisanship and cooperation between the parties. The GOP and Wolf then agreed on a record high of $12.3 billion for PreK-12 education. In addition to this impressive feat, there has also been an arrangement to impose an increase of $75 million in an assessment on hospitals, a 34 percent increase. As for Wolf’s second term, Wolf has created an aggressive agenda, despite facing a strong Republican majority in the General Assembly. 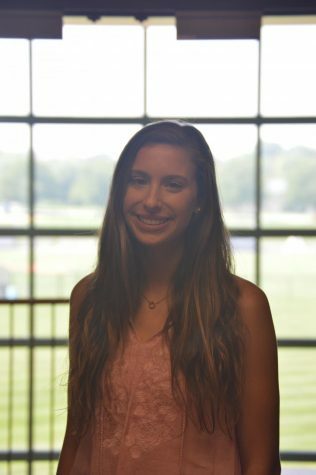 “You can choose as to whether you want to focus on things where we disagree and where we are different and, I think in American politics right now, we’re doing too much of that,” Wolf said. WITF reported that Wolf plans to push for policies to fight climate change, improve public education, fix inequities in Pennsylvania’s criminal justice system and make voting easier and more secure. He has detailed his continued hope to raise the minimum wage, expand background checks on firearm purchases, find a new way to fund public schools and also tax Marcellus Shale natural gas production. Wolf has recently has started a new 49 million dollar clean drinking water project. As of March 8th, the construction settlement with the Pittsburgh Water and Sewer Authority (PWSA) was completed to replace drinking water lead service lines in the distribution systems of Morningside, Homewood, Perry, Mount Washington, Southside and Greenfield neighborhoods in the City of Pittsburgh.